Most of the winter riding crew from my club, Gruppo 1, is now back from vacation in Kenya. It was 0C (32F) this morning but I wasn't going to miss the club ride because on Wednesdays we always stop for lunch at Boscomantico Airport on the outskirts of Verona. Perina, who is an old and savvy guy, determined the route today so that we would always be in the sunshine. That made it tolerable. We wound our way to Bardolino, soaked some rays next to the lake with in an espresso and then headed back to Verona. 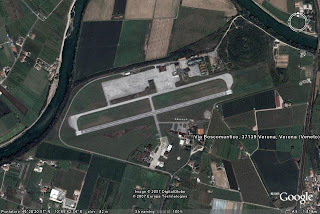 Just before arriving to Verona we turn into the Boscomantico Airport where there is a small, family run (3 generations of family) restaurant. The airport was used by the U.S. Army after WWII into the 1960s and there are many very interesting photos on the walls of the restaurant. I often wonder how my life might have been different had I been sent here in 1966 rather than the Laotian/Cambodian border. For lunch I had "bigoli" with small sardines. Delicious. Bigoli is a local pasta favorite. It's the opposite of thin pasta...it's a very thick round pasta. Of course, we had a primi, wine, bread, and espresso. I enjoy eating here because the grandmother makes very traditional dishes that you can't even find in restaurants (and believe me, Verona has very traditional restaurants). After a great lunch and good conversation (all in Italian of course) we get back on our bikes and finish our ride into Verona. It was 9C (48F) today so I joined the San Zeno group ride. They must have all taken EPO over the last few days because we were motoring after the first half hour. By the time we got back to Verona my legs were ready to fall off. In the map above you can see Verona, in reddish, at the bottom right hand corner. We typically wind our way to the Lago on back roads arriving at Lazise or Bardolino. From there we head north along the eastern coast of the lake (the road is right along the coastline) to Garda or Torri de Benaco. At this time of the season we will do some small amount of climbing and work our way back to Verona on different roads. In a few months we will be climbing up Monte Baldo which is the big mountain along the eastern shore. Now it's snow covered as it reaches 5,250 feet in altitude. Spring and Summer there will be rides north of the lake into Trento and even further north to Bolzano (for an overnight stay). 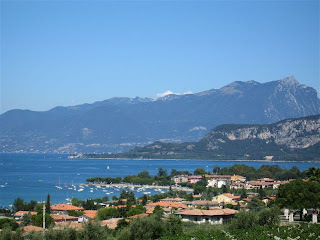 -villages along the lake: Sirmione, Desenzano, Salò, Gardone Riviera, Toscolano-Maderno, Gargnano, Limone sul Garda, Moniga, Padenghe sul Garda and Lonato in Brescia side of the Lake, Peschiera del Garda, Lazise, Bardolino, Garda, Torri del Benaco, Brenzone, Malcesine in Verona side of the Lake, Riva del Garda, Nago-Torbole in the province of Trento. The first race broadcast for this year will begin this weekend when the Tour of Qatar is aired. From here on out there will start to be a steady stream of cycling coverage, a big difference from the situation in the U.S. It's great to be able to see all the one day classics, the 3 major tours, world championships, and many of the races in Italy. Even the more important granfondos are broadcast on TV. 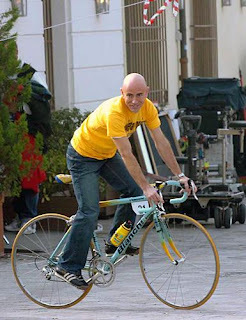 The "big event" movie wise is the Marco Pantani story which the national network, RAI, is airing on February 5th. Rolando Ravello will play Pantani, who died of a cocaine overdose in 2004. Ravello has trained for months on the bike to prepare for the role. The producer of the film, Claudio Bonivento, said that he wanted to show the talent and the weaknesses of the climbing specialist. The road along the Adige River, from Verona as you head towards Parona, is closed to all traffic on Sundays. It's scenic, receives full sun, and flat so it's immensely popular for an easy spin, and for rollerbladers and runners. Today I did several loops along the Adige and then added a small loop into Pescantina for about 1 1/2 hours of spinning easily, soaking up the rays and marveling at Monte Baldo in the distance. 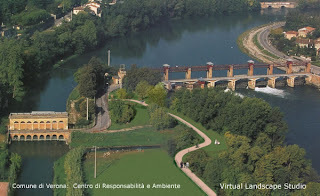 Photo: an aerial view of the "diga" (dam) where many clubs start their rides; you can also see the roadway to the right which is the one I refer to above. It was a gorgeous Saturday morning, clear blue skies, strong sun and 6C (43F) at 8:30 a.m. so it was a day for riding. I decided to join the Chesini club ride today that departs at 9:30 a.m. from a dam along the Adige River in Verona. I hadn't had a chance to ride my Pinarello since I changed saddles so I brought a wrench to make minor adjustments if needed. Even though I measured and re-measured everything at home my bones were just not in the right spot. So I pulled over to adjust things and ran into trouble. After loosening up the seat collar and moving the seatpost I just couldn't clamp it down, the bolt was just not grabbing. With time running out to make the ride I determined that the receiver for the bolt must have moved. Fooled around for a bit and finally was able to screw things down. I had to motor to the start where I met Eros and the group. Eros is the new President of the Chesini club and is leading Saturday rides. I should add that most of my own club members that ride through the winter are off on vacation in Kenya. So, I'm picking up rides here and there in the mean time. Things started easily enough but soon we were motoring to Lago di Garda. Arriving there we did some small climbs and then Eros went to the front and pulled us along really fast. I was working pretty good, he was soooooo relaxed; if he's a V8 I must have the watts of a lawnmower motor. Sigh. We didn't stop for espresso (I'm addicted) so it was a quick return to Verona for a total of a 3 hour ride. 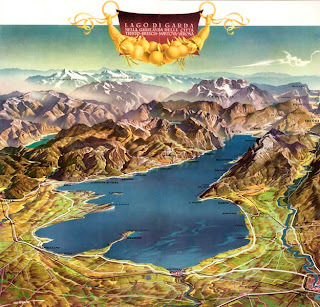 Photo is of Lago di Garda; the boats are in the small bay at Bardolino (where the wine of the same name comes from). Actually, now is a great time to ride to the lake as there isn't much traffic. In July and August it is very busy at the lake with lots of traffic. Summer the rides will head north into the Lessinia mountains or east to Soave (more wine county) and the hills there. Cooler, less traffic. Including one of me with Eros and of the Tom Simpson memorial. "Eros Poli is best remembered for his 1994 Tour de France stage 15 win of Mont Ventoux after a 106 mile solo escape. Eros, at 6 feet 4 inches and 187 pounds, was not a prospect to win one of the most difficult and famous climbs in the Tour de France. He escaped, however, from the peloton very early on and, under conditions of searing heat, arrived at the base of Mont Ventoux with a 22 minute lead. Steadily, the chase pack of climbers began taking back time. Arriving at the final 300 meters of the climb where the grade is 11% the lead had dwindled to 4 minutes. Eros survived Mont Ventoux and then hammered the descent to arrive in Carpentras to an incredible win by 3 minutes and 39 seconds ahead of Pantani and Virenque. 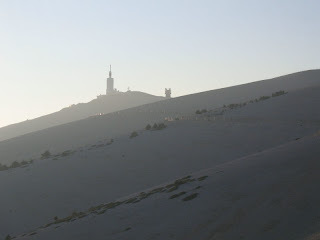 His escape and victory earned him the nickname “Monsieur Ventoux”. We departed from Verona on Friday, June 23rd, 2006. Nice, long distance, bus with an enclosed bike trailer being towed behind it. 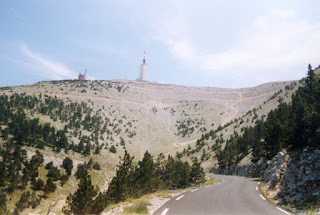 Along the way to Orange, France, which is where our hotel was, we watched a two hour video of the original TV broadcast when Eros Poli won the Mont Ventoux stage. It was very exciting to watch as the peleton kept creeping up on him all the way to the finish line. The TV announcer kept repeating that it was insane for Eros to attempt such a suicidal breakaway. It also gave us an idea what we were in for. From our hotel, and my window, I could see Mont Ventoux and the observatory (which is really the TV-RADIO tower/facility). Now, I know why they call it THE GIANT OF PROVENCE.....it just looms over everything. It looks white at the top, as if it were snow, but it's actually white rock. At the evening dinner Eros gave us each a specially designed jersey had had made for the trip which we were all to wear it on the climb. Saturday morning we departed for Bedoin with our bikes still in tow. 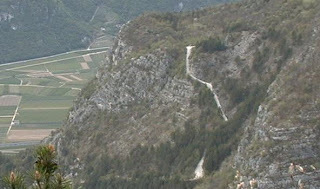 Bedoin is the nearest village to the start of the climb. We unloaded our bikes and some locals from a French cycling club rode to say hello to Eros and to take us on a warm up ride around Bedoin before getting on the road to that goes to Mont Ventoux. We ride through Bedoin (pretty town) and get onto THE road. The first 6 km are fairly easy with a slight incline, pretty views of the countryside. After 6 KM the road turns left and then BANG, you start into a wooded section and the road goes to 10%. It stays at about 10%, with some sections down to 8%, for the next 15KM!!!! There are stone markers along the side of the rode indicating the % of steepness. Even though it was wooded it felt like there was no oxygen, and hot hot hot. 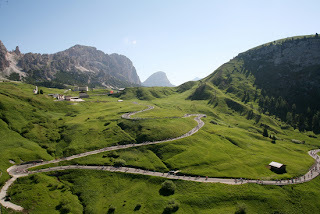 Unlike in Italy, there are no switchbacks...the road is always right there in front of you...unrelenting...up up up. Then you come out of the woods and you can see the observatory; the top of the mountain is completely barren, it looks like a moon-scape. Bare, bare, bare. Now there is no shade. Thankfully, there was a nice breeze (rather than the high winds which are so common) but the sun was really strong. It's 6 km of this and two switchbacks before you reach the top. Along the way you pass the memorial to Tom Simpson (who died here on July 13, 1967 from a combination of alcohol and heat exhaustion; he fell down, asked spectators to put him back on the bike which he rode to within a half mile of the summit before collapsing dead, still clipped into his pedals). The top section of the climb is less steep than the wooded section, 6-8%, but there is that 11% pitch at the end. The lower section took its toll, and now with the sun and heat on the barren top section, lots of people are off their bikes and walking at this point. None from our group. I get to the top!! Rode the whole thing. 2 hours 15 minutes of continuous climbing. I could have gone a little faster but not knowing exactly how hard it would be I kept some energy in reserve. At the top there were some Frenchmen selling some sugar coated jellies and I bought several handfuls which I devoured. Took some photographs; the elevation is 1900 meters so the views were spectacular and we had a clear day. We then rode down and just before you hit the wooded section there is a restaurant, the Chalet Reynard. We all had a celebratory beer and relaxed in the sunshine. Then we were back on our bikes. 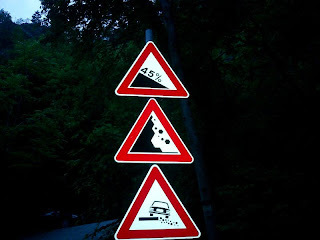 Eros warned us to be careful as you can really gain speed through the wooded section (remember: no switchbacks and now it's a 10% downhill) and your speed can reach 100km per hour! We all make it back to the starting point safely. Loaded the bikes and returned to the hotel where a poolside buffet awaited us. Everyone relaxed around the pool and talked about the day. Sunday was the long trip back to Verona. Eros is organizing a long weekend for this summer to climb Alpe d Huez, Galibier and Telegraphe and another climb I can't recall at the moment. A good goal to get in form for. I was chatting with a shop owner in Verona one day and he tells me that the coffee bar near Piazza Erbe is owned by an ex-professional rider. So, I eventually go there and meet Eros Poli. Before turning pro he was both an Olympic gold medalist and World Champion. His pro career is best remembered for being a leadout man on Mario Cipollini's SAECO train, and more importantly, for winning the Mont Ventoux stage in the Tour de France of 1994. That victory is a story for another day but it was so unexpected, and beautiful, that Eros was given the name of Monsieur Ventoux by the French press. Today was a miserable day...chilly, misty, raining, and windy. The streets of Verona were virtually deserted so I went over to Eros' place and over some wine he told me good stories about riding in the Tour de France, Giro d'Italia, Paris-Roubaix and other one day classics. I couldn't help thinking how on TV it's hard to grasp the amount of suffering and pain a pro cyclist endures in a race. I met Eros last May and since then we've become good friends. 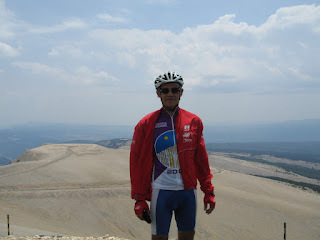 In July, 2006, Eros organized a ride of Mont Ventoux and I went along with a busload of Veronese. It was a fun trip and climbing with Eros was the best part. Thankfully, he didn't put the hammer down. Later on in the year I went to the Milan Bike Show with him and the owner of the Chesini bike shop (Chesini has been in business in Verona since 1925). Everyone knows Eros and I was able to meet Eddy Merckx, Felice Gimondi, Mario Cipollini, the Pinarello and De Rosa families. In the future I'll write in detail about these experiences. 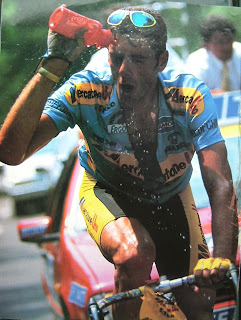 Photo: Eros Poli on Mont Ventoux, 1994. The day was a furnace, 107 degrees +. 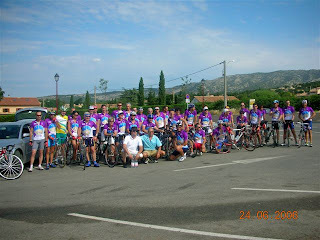 In 2006 I joined the Gruppo 1 cycling club which is headquartered in the San Massimo community of Verona. It has approximately 50 members and celebrated its 25th anniversary in 2006. The President is Beppe (Giuseppe). His wife is Daniela. 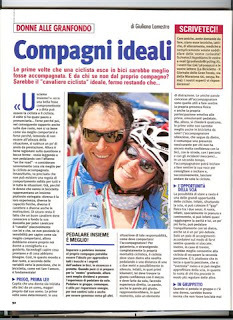 They were featured in a GRANFONDO magazine article entitled "Ideal Companions". Both are very good cyclists. Beppe has a full time job and spends the bulk of his free time on club related activities. The club has it's own place for meetings (weekly, on Thursday evenings starting at 9:30pm.....things get started here late in general! ), luncheons and dinners. The club also has a van which is used to take bikes and members to events, and is also used on the week long tours as a sag wagon and rolling restaurant. Club Rides: rides for members, or guests, ranging from 4-5 hours, all day, multi-day rides, to a one week tour. All day rides involve riding from Verona or taking the van and then riding. On multi-day rides the van always comes along to provide sag support and to set-up the lunch stops (which can include making pasta and basically having a feast). There is also a one week "tour" ride. Last year's one week tour took us to Corsica; this year we will be going to southern Italy to ride in the Puglia region. Raduno: each club in the Province of Verona sponsors a "raduno", usually held on Sunday mornings. This is unlike any event in the USA. Approximately 500 cyclists come to each one and goes off as a group led by motorcycles and police cars to close off the roads as the group passes. The route is normally about 30 miles in length with the first half being ridden at a leisurely pace and the 2nd half at about 18-20mph (depending on the hosting club which always rides at the front). Afterwards there is food and wine and prizes are handed out. The prizes are based on the number of participants from each club. What's nice is that every club receives a prize. Prizes include trophies, formaggio, salumi, etc. It's a low key, fun, activity. At the end of the season there is a totaling of all the points accumulated by each club and there is an awards dinner and the 1st place, 2nd, etc., are announced as Verona Province champions. I should add that each year there is a national raduno rally which the club attends where cyclists come from all over Italy to ride. Granfondo: the club has a short list of 5 granfondos it enters. Lui Lei TT: a his and hers 2 person time trial. The club also has a ride every Wednesday a.m., and on Saturdays that are not scheduled with any of the above. As you can imagine it's a busy cycling season from February-November; from December to February the Wednesday and Saturday rides continue. There are all several luncheons and dinners as well during the year that have to be squeezed into the schedule. Gruppo 1 loves to eat well and have a good time! Joining an Italian Cycling Club...it's different! First you should know that Verona has 50+ cycling clubs. Second, unlike the USA where you can join several clubs, here you can only join one! The underlying reasons for this are that with club membership you also automatically obtain membership in one of the national cycling societies and you are also subscribed in an insurance program. When you come from a culture of being in many clubs (for the flexibility in choosing different rides, being with friends that are in other clubs and going to the social events) the Italian system is somewhat confining. You could say that the opposite is true as well, i.e., the clubs here have very strong bonds between members. Choosing the right club, therefore, is very important. Initial club membership costs about 80Euro. You typically receive a full cycling kit including bib shorts, jersey, gloves, socks, and a windbreaker. Winter jackets, pants are an additional cost. You must also have a physical examination. There are two types: a basic physical examination that allows you to participate in all club events and non-competitive events (as an example, the short distance course in a granfondo), or a physical examination+stress test which allows you to participate in all types of events. Not wanting to be limited to what kind of events I could enter I went the physical examination+stress test route. I visited a sports doctor where I was tested for lung capacity and put on a stationary bicycle for the cardiac stress test. Not only did the doctor review the results but the results were sent to a cardiologist for confirmation that everything was in order. Two weeks later I received a letter that states I could enter competitive events. I carry a "attivita agonistica" (competitive activity) license which has to be renewed every year, and I have to go through the test process every year. The cost of the examination is amazing low, 75Euro. For me it seems a very inexpensive proposition for verifying that my heart is OK.
By the way, I'm at that point in life where I'm in the last "age group" as far as these things go. My age group is "SUPERGENTLEMEN A". It's funny how English words work their way into the Italian language in some of the strangest places. Shortly after arriving I joined a club whose main interest was in racing in granfondo events. I certainly wanted to do that but the club was way too serious. At the start of the following year I joined Gruppo 1, a club that was much more social, has a great program of activities, and there is a small sub-group that races in granfondos. They own their own small "sede" (headquarters) where meetings and dinners are held, and their own van for sagging on long trips. Very warm, kind and friendly people. When I am with them I am immersed in an entirely Italian world. 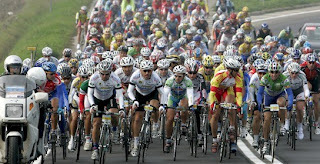 Photo: some of the Gruppo 1 members on the Tour of Corsica in 2006; I'm holding the rear wheel. "I'm destroyed". Those were the parting words of the spinning instructor for today. I belong to the FITNESS FIRST gym in Verona where I go for spinning classes when the weather isn't good, and to do some weight training. One of the biggest differences between spinning classes in Italy and the USA is that everyone here is already in shape! Today was a tough spinning class. I still had some lactic acid in my legs from Saturday when 20 minutes into the class the instructor had us stop and pull out our seatposts. For the next 35 minutes it was out of the saddle....slow, fast, different positions, etc. Thankfully, there was great music blaring that distracted me from the signals my brain was sending (STOP!). It gave me satisfaction to hear the instructor say at the end, "Sono distrutta." That made two of us. The incredible weather continues in Verona. Although a bit foggy it was 9C (48F) this morning so it was off to riding again with the San Zeno group. The route this morning took us to Cola, Pacengo, Lazise, Bardolino, Garda (must stop for espresso of course), and back to Verona via Pescantina. Rides to Lago di Garda are very popular in the winter because it's always warmer there than in Verona, and it's so beautiful. I should point out that Lago di Garda (Lake Garda) is the largest lake in Italy. It was formed in the last Ice Age and covers 370 sq. kilometres, reaching right up into the Alps. Somewhere between Pacengo and Lazise I heard a crack and I said to myself, "I've heard that sound before." Next, I felt it....the saddle titling to one side. An inspection at the espresso stop confirmed that one of my titanium rails on the saddle had snapped. I've had this saddle 10 years now, it's really "close" to me. About 5 years ago one of the steel rails had snapped on it as well. The manufacturer, Selle San Marco, repaired it free of charge but they no longer had steel rails available so they upgraded it with one of the few titanium rail sets they still had. So, it's time to retire it. But, I hate changing saddles. A frame that fits well and a comfortable saddle are so important in cycling. An uncomfortable saddle can be torture. An expensive saddle is no guarantee that it will be comfortable. What is a comfortable saddle for one person is uncomfortable for another. Finding the right saddle is a matter of trial and error. Changing saddles will also, very likely, mean adjusting the seatpost height and making forward and aft adjustments in order to get the position exactly right again; when you ride thousands of miles per year your position is dialed in just so. This morning I joined the San Zeno group for a ride; they ride every Tuesday, Thursday and Saturday year round. 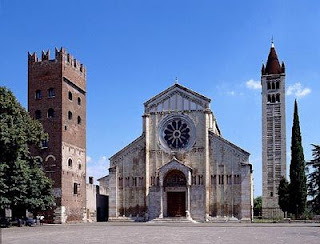 I call them the San Zeno group because they are from the Verona city quarter of that name. 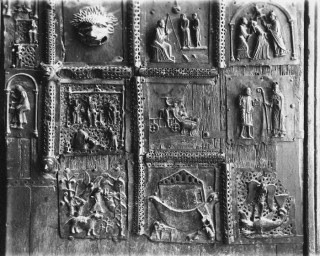 The San Zeno church, the most important building in the quarter, is quite lovely and has wonderfully interesting bronze doors (see photos). It was 6C (43F) this morning so after cereal at home, a stop at Cafe Crestanello for espresso, a ride across Verona, I met up with the group. It was a spirited ride that took us to Lago di Garda and the towns of Lazise, Bardolino, and Garda (where we stopped for a quick espresso) and then back to Verona. 3 hours at a very good pace; on the way back two strong guys from another club passed us and we all latched onto their wheels and rode quite a bit of time at 25mph. The weather is supposed to FINALLY get colder so riding outside may be curtailed somewhat. Verona feels like the epicenter of cycling. On a weekend there must be THOUSANDS of road cyclists on the roads. There are 50+ cycling clubs covering cicloturismo, road racing, track racing, triathlons, and mountain biking. It's not unusual to meet pro teams training in Lago di Garda and meeting professionals on the roads. Two I have met are Damiano Cunego and Michael Rasmussen (winner of the climber's polka dot jersey in the Tour de France). "Il Piccolo Principe", Damiano Cunego, lives here in the province of Verona in the town of Cerro Veronese. 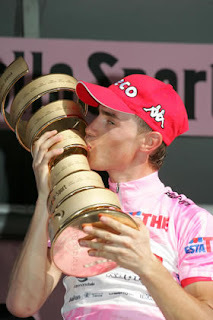 At age 22 he was the youngest winner of the Giro d'Italia in 2004 (photo). In 2006 he won the white jersey for best young rider in the Tour de France. Verona will be at a fever pitch when the Giro comes to the city on June 2nd, hopefully with Damiano leading in the pink jersey again. I was reading in the newspaper that Damiano rode 170km yesterday so his training is well underway. In comparison I've been a slug with my longest ride being 72km this year. My only excuse is that I don't get paid and I'm not 25. Adjacent, and just north of the province of Verona, is the province of Trento. 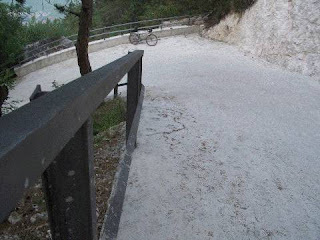 Located here is the hardest climb in Italy and perhaps Europe. The Scanuppia Malga Palazzo climb is 8km long, starting from Besenello and ending at a nature preserve. Most of the ride reports I've read about involve stopping and starting repeatedly to get up; weaving back and forth is close to impossible because of the narrowness of the paved road. One person that did make it up without stopping, and with great difficulty, used a 22 (front) x 28 (rear) gear combination! I hope to pay a visit this Spring or Summer but like so many others I think I'll be walking a bit. A gran fondo is a race usually 160-225 km long. 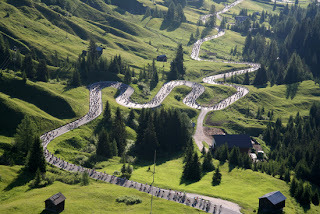 The ones I have entered (Maratona dles Dolomites, Avesani, and Gran Fondo Italia) are competitive, timed events. All riders have timing chips attached to their bikes. Results by overall classification, age groups, and team competitions are posted immediately after the event and there are award presentations. While you can "take it easy" virtually everyone is there to do their best. To enter these events you must pass a stress test and have a letter from your physician saying that you are approved for racing. That letter is than used to obtain your race permit. The larger events offer additional courses of shorter lengths such as 120-160 km and under 120 km. These shorter courses use most of the same roads but take shortcuts to avoid some of the climbs. 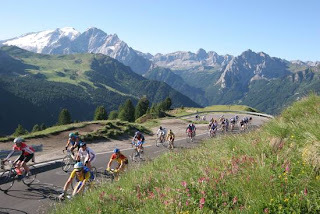 The largest gran fondo is the Novi Colli. Novi Colli means 9 hills, and the event covers 210km and 9 hills through the Romanga countryside and Apennines hills. The event starts and finishes in the town of Cesenatico (home to the late Marco Pantani), just up the coast from Riccione, and attracts 10,000+riders from all over Europe. There is a shorter version of 130km and 4 hills. 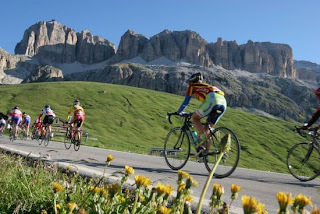 The next largest gran fondo is the previously discussed Maratona dles Dolomites with 8,500 (the max limit set by the organizers) participants. One of the most interesting and growing rapidly in popularity is the Gran Fondo L'Eroica. Entrants must ride vintage bikes so tubular tires, down tube shifters (even rear shifters!) are the norm to be ridden across the "white" roads of Tuscany. 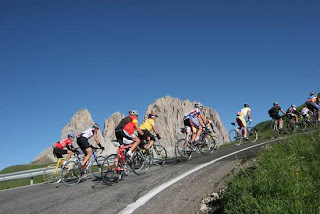 There are hundreds of gran fondo events all throughout Italy. There is even a magazine dedicated specifically to this aspect of cycling in Italy. Some events are broadcast live on TV on RAI3. 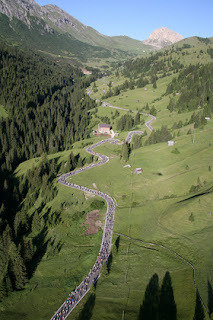 The photo above is from the Gran Fondo Italia. It was smaller, and flatter (only one nasty, short climb), than the others I had raced in. So, it felt more like a race as there were always riders VERY close, lots of pacelines, bunches, etc. My heart rate was way up there the entire time not only from the effort but having to be insanely focused. I did the 62.1 mile route at a 20.5 mph average (I am improving!). There are USA based bike tour operators that are now organizing tours around gran fondo participation. Some of the other most popular gran fondos are the Campagnolo, Pinarello, Colnago, and Dolomiti Stars. 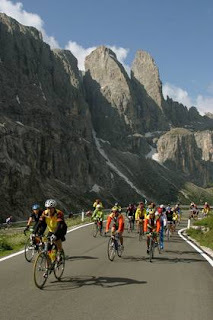 On July 2, 2006, I participated in the "Maratona dles Dolomites" which is considered the most beautiful, challenging, and well organized granfondo in Europe. 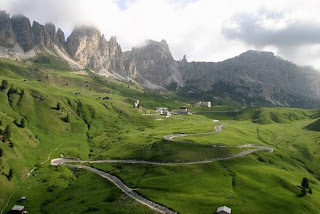 The beauty of the Alta Badia region of the Sud Tirol is spectacular. No wonder approximately 18,000+ individuals from all over the world enter the drawing for 8,000 slots. That's me in the day glow yellow jacket, red sleeves, and sunglasses at the start. It was 32 degrees on July 2nd at 0615 when the race started. The other photos are also of the 2006 event. In November, 2006, my name was drawn again ! So just today I was busy making hotel reservations and planning our trip for July, 2007. And thinking how much climbing I'll have to do during the Spring to get ready. DEW D R O P S...I can imagine that today, at this moment in time, you are not very interested if I say that the element we want to talk to you about is a combination of two parts of hydrogen to one of oxygen. And you will be even less interested in the fact that heavy water is where the hydrogen has been completely or partially replaced by deuterium and that it is used to produce nuclear power.Perhaps it might be more interesting to say that even the ancient philosophers considered it one of the four elements making up the universe together with earth, air and fire.Many of you, visiting our site, will have seen a drop of water like a very pure topaz, or will have associated the drop with a ripe fig, imagining the sweetness of its juice.For some it will be a sort of virtual rock of Sisyphus or the drop that makes a bath overflow. A river is born drop after drop… you will be disappointed and saddened, but fate is a sort of hinge on which much else depends.Come now, we do not want to see teary eyes and don’t frown that way either: none of you have ever been without a drop of blood, there has never been any Pentecostal rain of tongues of fire. There are far more serious problems in the world. Or opportunities. The opportunity we have to help children in Africa. They are thirsty. Think of the happiness that we will be able to give these children. Think about those huge eyes that shine with joy as they see water gushing out of the bowels of the earth. It is truly Holy Water for them, Gotes de Vita, “drops of life”. We clearly feel their incalculable happiness that is reflected in a large mirror and like drops of life directly enters us. And opens up our hearts. Cycling friends, let’s all smile together: the children will sense it and will laugh together with us. The Veronese cycling community is fired up about the Giro d'Italia coming here (Verona) this year. The next-to-last day of the Giro, June 2, will be a 42km individual time trial (ITT) from Bardolino on Lake Garda to Verona. There is a slight rise after departing from Bardolino (one I'm too familiar with) and then it's essentially flat so it will be a day for the time trial specialists. If the classification is not locked up in the Dolomites the time trial to Verona could be the decisive stage as it was in 1984. 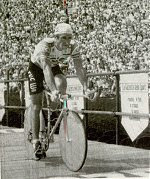 Verona has hosted many important stages in the past but the most famous was the final, 22nd, stage of the 1984 Giro. The race was concluding with a 42Km ITT from Soave to Verona. Laurent Fignon (France) and Francesco Moser (Italy; from nearby Trento) had traded the pink leader's jersey throughout the race. Entering the last day Fignon held the pink jersey. Moser won the stage and won the pink jersey when he entered the Arena (Roman coliseum) in Piazza Bra (photo). 2006 was an incredible year of riding in Italy, and also Corsica and France. So many adventures! Climbing the Stelvio; climbing Mont Ventoux with the 1994 winner of that stage, my friend Eros Poli from Verona; racing in 3 granfondos (GF Maratona dles Dolomites, GF Avesani, GF Italia), a one week Tour of Corsica, riding in the "raduno" events in Verona province, attending the Milan bike show and meeting Eddy Merckx, Felice Gimondi, Mario Cipollini, the De Rosa and Pinarello families. Meeting Rasmussen and Cunego on the roads of Valpolicella was very nice as well. For as incredible as all of that was, the best aspect of the year was the friends I made at the "Gruppo 1" cycling club of San Massimo, Verona. They are a tremendous group and I'm fortunate to have found them, and fortunate that they have "adopted" me. So many rides, so much fun! For 2007 I'm going to attempt to write and post photos about cycling in Italy and the riding culture, and take a few trips back into 2006. NOTE: WE LIVED IN ITALY FROM AUGUST, 2005 TO JUNE, 2008. I BEGAN THIS BLOG ON JANUARY 1, 2007 FOR THE PURPOSE OF KEEPING MY FRIENDS BACK IN THE UNITED STATES INFORMED OF MY CYCLING ADVENTURES. UPON RETURNING TO THE U.S. IN JUNE, 2008, I DECIDED TO CONTINUE THE BLOG SO MY FRIENDS IN ITALY AND BLOG READERS AROUND THE WORLD COULD SEE WHAT CYCLING HERE WAS LIKE.